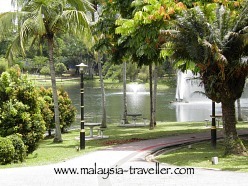 Taman Tasik Permaisuri is a pleasant urban park in the Bandar Tun Razak district of Kuala Lumpur, about 6 km from the city centre. It is managed by Kuala Lumpur City Hall. The park covers 40 hectares with a scenic lake at its centre, enlivened by a number of fountains which, amazingly, all seemed to be working when I visited. Parts of the lake are covered with pink lotus flowers and lilies. There are shady picnic spots around the lake with concrete tables and stools provided. 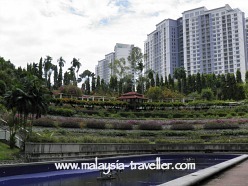 The park is attractively landscaped on naturally hilly terrain. There is a park-within-a-park section with a terraced amphitheatre planted with colourful species. There are four seating gazebos in this area which enjoy a view over the lake. The gates to this section bear the name Taman Puteri Iskandar. 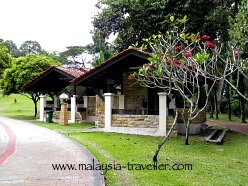 Activities and facilities here include a football pitch, a futsal court, children’s playground, surau and cycle hire (although cycling is not permitted in some parts of the park). Jogging/walking trails extend into the more jungly southern section of the park which has been left in a raw, natural state. Elsewhere is a hard landscaped space with brick pillars which was no doubt intended for multi-purpose use but instead is looking rather decayed and unused. Horses are kept in an enclosed area with a paddock on the western edge of the park but I think these belong to City Hall and are not for public use. 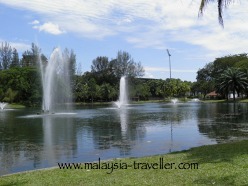 On the eastern border of the park is a large football stadium and a public swimming pool, part of Bandar Tun Razak Sports Complex. This neighbourhood recreational park is a pleasant and convenient place for nearby residents but it is not really a tourist destination. 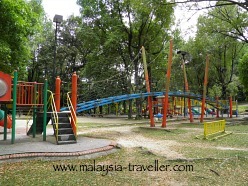 As far as suburban parks go, I preferred Bukit Jalil Park. The park is open daily during daylight hours, 7am — 8pm. There is plenty of free parking at the entrance. 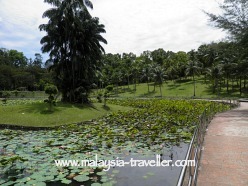 The location is marked on the map on the Malaysian National Parks page.